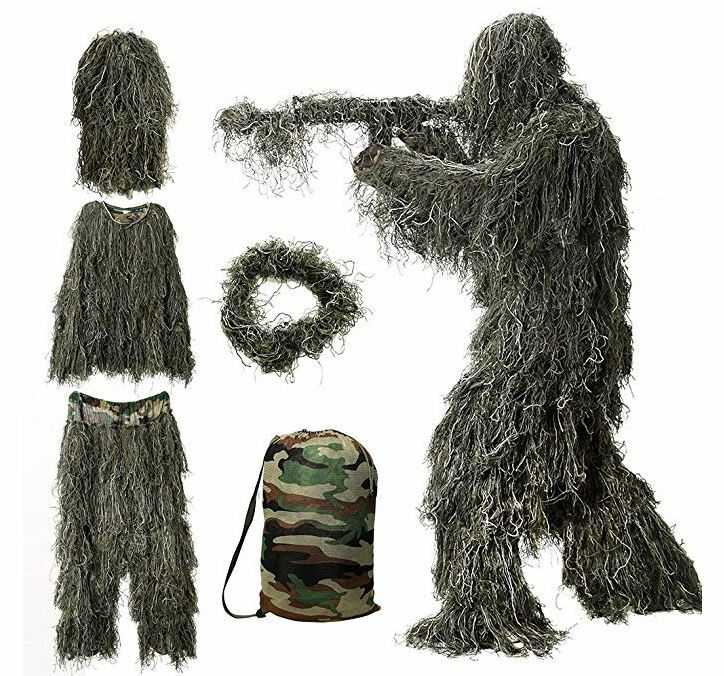 Camouflage Design: Ghillie suit is designed as a protective clothing, as it allows people to blend into outer environment Package Includes: Pack of 5 in 1 Ghillie Suit includes hood, jacket, pants, gun wrap, and a stuff sack. Portable to get it into stuff sack enables to carry Size (XL/XXL) Details: Adjustable waist size: 25"- 48"; pants length: 43"; shoulder: 21"; chest size: 40"- 50"; sleeve length: 35"; jacket length: 31" Quality & Application: Tough and durable Polyester and Synthetic Thread which is water-repellent, fire-retardant, mildew proof, rot proof and lightweight. Widely used for Hunting, Shooting, Wildfowling, Stalking, Paintball, Airsoft, Surveillance, Wildlife Photography, Birdwatching Halloween and any other situations where you need deep camouflage Lifetime Warranty with no hassle. Great gifts and cutomized Halloween or Christmas costume play with MOPHOTO Ghillie Suit for more choice!